The longer inventory sits on your lot, the more money you lose. 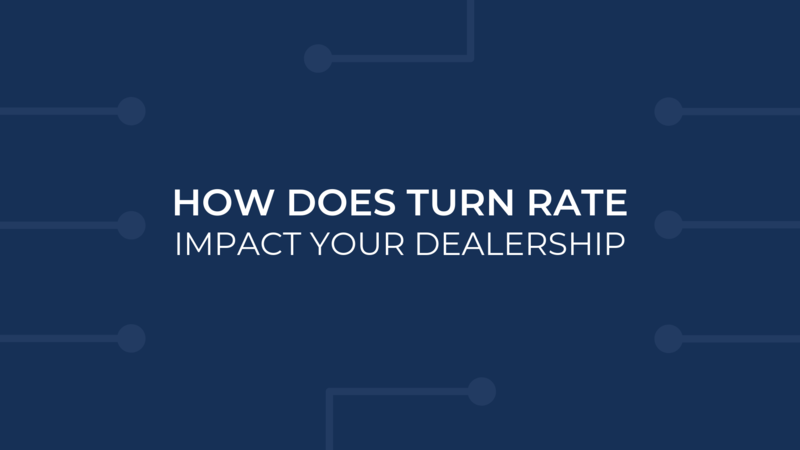 That’s the harsh reality of the business and why it’s essential for your dealership to not only keep track of turn rate, but to work on strategies to move more metal off your lot faster. Why does turn rate matter so much? Let’s break this down with a simple math problem...Let’s say you are a dealer that sells 100 vehicles each month. You have 250 vehicles in stock, and your turn rate of inventory per year is 4.8. If you are able to increase your turn rate by 10%, or 10 vehicles per month, you can add 120 additional units at $2,000 per copy, which means your dealership can increase gross profit by $240,000 in a year’s time. Wouldn’t you like to see that in your bank account? Increasing your turn rate will help you to decrease floor cost, curtailment charges, and keep your cash flow going. Now that you realize how much money is at stake, it’s time to start focusing on ways to improve your turn rate. As the majority of the car buying process happens online, you need to set your website up for success. It’s essential to create detailed Vehicle Display Pages (VDPs) that include information about the car that is easy to read and find. Some cars have certain features that attract buyers, such has tow-hitches, sunroofs, or backup cameras. Are these features easy to find and explore on your VDPs? When you make it easy for consumers to navigate and research your inventory online, not only will you see an increase in time spent on your VDPs, but also an increase in conversions. A good VDP will engage a consumer, keeping them on your website to learn more about a vehicle’s features and building trust with your brand. Organizing the vehicle’s information on VDPs and merchandising your inventory so it is easy to search will help consumers find the right vehicle and will help you sell more inventory. Along with merchandising the vehicle, you will want to make sure you get your new inventory on the website as soon as possible. As you can see, improving your turn rate comes down to knowing how to merchandise your inventory. Dominion Dealer Specialties conducted a survey and found that merchandising tools significantly improve the turn rate for certified, new, and used vehicles. Certain merchandising tools helped dealers to significantly reduce the number of days that it took to sell a vehicle. In particular, using a merchandising tool that allows customers to interact with the vehicle’s interior and exterior, and highlights certain best-selling features on a vehicle has been proven to make a difference in turn rate. How much of a difference did SpinCar’s 360° Interactive WalkAround make? Managing your inventory, combined with performance merchandising will lead your dealership to an increase in turn rate. Knowing what tools and strategies to use will help you to not just save money, but to make more money. Incentivizing your salespeople will help increase turn rate by motivating your team to keep up with vehicle merchandising imagery. This will allow the salesperson to promote themselves, the dealership, and the vehicles on the lot as they generate leads and build relationships. You can also increase your turn rate by decreasing the amount of days it takes to get a vehicle ready for sale. Time-to-market has a direct influence on turn rate and cutting this time in half will save you money on holding costs and yield more monthly turns. As inventory comes in, getting vehicles ready to sell and on your website quickly will help increase your turn monthly, quarterly, and annually. By using data driven management tools, detailed VDPs, and an interactive 360º WalkAround, dealerships can make sure the inventory on their website is showing consumers what’s important to them. Vehicle detail pages give consumers specific and absorbable information that keeps them on dealer sites longer. Engaging, interactive 360º WalkArounds allow for customers to get a completely transparent and immersive view of a vehicle, increasing your turn. Truly knowing and understanding your numbers when it comes to inventory is imperative to influencing your turn rate.